Harry Bierce, Lupine Time. Exhibited Students Art Club, Tampa Public Library, May 1922. Oil on canvas, 16 ¼ by 26 inches. Before moving to Florida Harry Bierce worked in the art and modeling department of the American Museum of Natural History in New York City, and was assistant state archeologist for the State of New York in Albany. For extra income he worked as a guide taking campers into the Adirondack Mountains. Self taught, his love of the outdoors and nature lead to his becoming a landscape artist. Bierce moved to Auburndale, Florida in 1913 and bought a home on Lake Arianna. 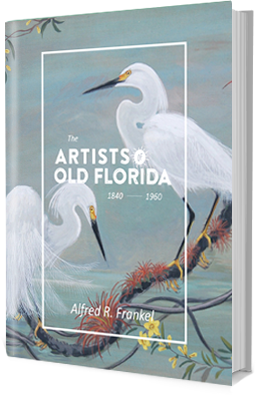 He did illustrations for the Florida Growers Magazine, and from 1939 to 1951, the art, including entrance decoration, life sized animated figures for exhibits, and murals for the Florida Orange Festival. In 1935-36 Bierce was the only white man allowed in Seminole villages to freely photograph and paint them in there natural environment. It was Bierce who suggested the Seminoles build a separate Indian village for tourists, maintaining their own privacy while profiting from tourism. In 1937 he designed a Seminole Indian exhibit for the Great Lakes Exposition in Cleveland, Ohio. Bierce built many models for commercial real-estate exhibits. In 1939 he designed the Seminole exhibit at the New York World’s Fair, and the entrance to the Florida Pavilion, at the Fair, where a large animated figure of Ponce de Leon greeted visitors. He designed floats for Tampa’s Gasparilla Festival, and exhibits for the State Fair. Bierce’s love of nature and Florida eventually turned him to work almost exclusively in painting and sculpture. Many of his murals are on the walls of Florida libraries, theaters and businesses. Two large landscapes are on the first floor of Tampa’s, John Germany Library. The relief model of Tampa’s Davis Island, used in construction of the island, was made by him. Tampa’s Valencia Gardens Restaurant on West Kennedy, was opened in 1927. Bierce lived next door to the owners, and in 1947, was commissioned by Manuel and Rose Beiro, to create large murals, each one depicting life in the owner’s native Spain. Bierce’s sculpture of two playful dogs was in Plant Park. Born: July 25, 1886, Cortland, New York. Died: October 2, 1954, Tampa, Florida. Directory: Listed in the Tampa City Directory, 1921, 22, 23, 1925, 1930, 1933 as an artist with a studio at 513 Maxwell Avenue, later Hamilton Heath, and in 1933 at 5406 Taliafero.